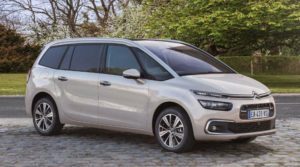 The Citroen C4 Grand Space Tourer has been updated for 2017 models all cars receive a newly redesigned front end with three-tier lights, a two-part grille, chrome trim around the daytime running lights and a second air intake in the redesigned bumper. At the rear are new 3D-effect lights. 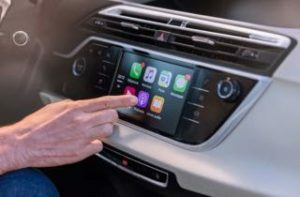 Inside is a new seven-inch touchscreen that include Apple CarPlay and MirrorLink, plus a new navigation system that includes real-time traffic updates. New safety equipment includes a coffee break alert for drivers; speed limit sign recognition; a driver attention alert, with a visual display and sound; an active lane departure warning system; blind spot monitoring; active cruise control; and autonomous emergency braking to prevent low-speed collisions. New external colours have been added, Lazuli Blue, Soft Sand and Cumulus Grey. What has been carried over is the the assured drive, comfortable seats, wonderful views from the enormous front windscreen, little wind or engine noise at motorway speeds and competent handling for such a tall vehicle. Space is excellent in the Grand Space Tourer, the three middle-row seats slide independently, while the outer pair flip up cinema-style before sliding forward, allowing decent access to row three, The rear seats fold into the floor easily to reveal a well shaped boot that will swallow 793 litres of luggage when the middle row is slid into its furthest forward setting. Folding the middle row is easy, too, while for really long loads the front passenger seat folds. The 2018 Grand Space Tourer, as well as dropping the name Picasso, has new trim names, Touch Edition, Feel and Flair. the base Touch Edition is very well equipped with air conditioning, cruise control, start stop engine button, DAB radio, Rear parking sensors, LED daytime running lights and 16″ alloy wheels, the Feel trim adds front parking sensors, Connect Nav, 17 inch alloys, a 12 inch panoramic LCD display which monitors essential car functions such as speed, fuel engine management and where fitted the reversing camera. The Flair is the top trim with 18 inch alloys, panoramic glass roof, park assist (the car parks itself), reversing camera, electric tailgate, keyless entry and a blind sport monitoring system with an led alert on door mirrors. 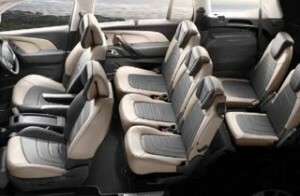 The diesel engines are carried over from the previous model but the three cylinder 1.2 litre petrol with 130 bhp is added as a six speed manual or six speed EAT automatic, the petrol does a good job of pulling the large frame of the Grand Picasso around, 0-62 is a respectable 10.8 seconds and the claimed economy is a cracking 55.4 miles per gallon. The two diesel offerings are the new 1.5 litre with 130bhp, which can can pull the Grand Space Tourer to 62 miles per hour in 10.4 seconds and on to a top speed of 123 miles per hour and return a claimed 68.9 miles per gallon, this engine is available as a six speed manual or an 8 speed EAT automatic (not joined Scheme yet). The 160bhp 2.0 litre diesel boosts the power, 0-62 in 9.2 seconds, but feel it’s only required if you travel fully loaded or need to tow a large caravan as the braked weight rises from 1500kg to 1600kg, this engine is paired with an EAT 8 speed automatic gearbox (60.1 mpg). Automatic cars start at £1595. 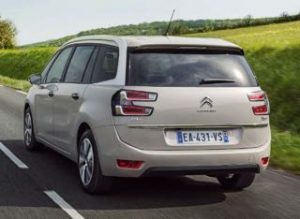 Spring Best Buy – Citroen C4 Grand Space Tourer 1.2 Petrol 130bhp Manual ‘Touch Edition’ – £395 Advance Payment (£64.72 wpms) or £1595 (£493 wpms) as an automatic in Feel trim.